I’ve been a CPA since 1984 and have always used “old school” methods to analyze cash flow. By that, I mean managing cash and other assets based upon historical accounting statements. I’ve been a colleague of Sandra’s for four years and she really opened my eyes as to how to best manage a firm’s cash resources in an optimal manner. Sandra is a true pioneer in the field of cash flow and wealth management. This method works. It worked for my company… I personally know the owners of other companies that Sandra has turned around with it, and it will work for any company, or personal budget, for that matter. Sandra knows her stuff. 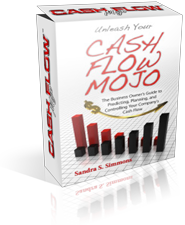 If you want to be wealthy, you need to implement the process of Cash Flow Mojo. When I was visiting my accountant for my annual meeting with him, I was telling him about the cash flow software and he wanted to see how it worked. So I just logged in on his computer with my login info and password to my account and showed him the software with my data and information. He thought it was great and wanted to have his other clients use it too. I told him this is the software tool I’m using now to get my finances of the business in order and increase my cash flow. Thank you.